Hey everyone! I was lucky enough to receive some of the new Osbourne collection by MAC recently to review. I am in love with a few of these products! Read on to hear my thoughts and see swatches. I will have release and pricing details at the bottom of my post, along with the shade collection. "The most fabulous mother-daughter duo is coming to M·A·C ! We are thrilled to announce a limited-edition colour collection with the inimitable Sharon Osbourne and Kelly Osbourne." Starting with the MAC Kelly Osbourne collection. First off, I am in LOVE with the packaging apart from one thing.... it feels quite light and cheap. The appearance is awesome though - loving the metallic lilac hues and classic 'celebrity' signature speel that MAC likes to do. Starting with Kellys eyeshadow quad - the 'Bloody Brilliant' palette. Containing four gorgeous complimentary colours in the shades Tickety Boo, Fizzy Rose, Spoonful of Sugar, and Shadowy Lady. The shades range from a shimmery silver, soft lilac pink, soft muted plum brown and the dark plum. The darkest colour doesn't blend out too well, but works well in the outer corner. A must have quad for any purple/lilac lovers! This lipstick shade is so pretty! It is VERY creamy and opaque, but not chunky. This lilac shade is named 'Dodgy Girl' - love the name! I love this one. Next is 'Kelly Yum Yum' which is similar to the permanent Candy Yum Yum. It is a bright blue pink, but even then, it leans slightly more warm than CYY. I'll have a comparison swatch blog post up tomorrow! 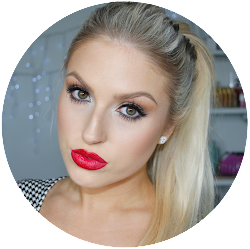 I love this shade, but if you already own CYY, you may want to give it a miss. Next is the Jumbo Penultimate Eyeliner in Rapidblack. I'm not crazy on these eyeliner pens, but I know some people are. They're not my cup of tea. This one is uber black, but it seems to feather a bit as its quite thin and liquidy in its texture! Not my kind of thing for the steep price tag! Next we have the Sharon collection, which is in red packaging. Don't love this as much, but there is a gem of a product in here you MUST get! This blush!! BUY IT! It is called Peaches & Cream. It is described as a mid-tone rose, and is a satin finish which looks amazing on the cheek. It is the perfect watermelon pink and is like nothing I have ever used before... personally. And I have a rather large blush collection! Love! This lipglass is called Bijou. It is a soft rose pink. Typical lip glass formula, quite sticky, vanilla scent, quite pigmented. Its a nice everyday shade as its neutral and wearable, but with hints of brighter pink. Nice to wear without being too 'BAYM'. Last thing I got is this PatentPolish Lip Pencil. This shade is 'Ruby' - described as a mid-tone rose. I describe it as a soft red. I have the whole collection of the PatentPolish range that came out a few weeks ago and this particular shade doesn't compare. Its patchy and not consistent. Im hoping the other shades in the Osbourne range are better than this one! Or, maybe I got a dud. Not sure. I'd honestly suggest swatching this one in store before you buy it! Overall, I am in love with many of these products and am 100% going to pick up a few more products if I can when the collection is released. I'm dying for the other blush, lipsticks and MSF's. Will you be picking anything up? Here is the full list of products, and NZ RRP. Available August 4, 2014 at select M·A·C locations (Limited Life collection) AVAILABLE M·A·C Westfield St Lukes, 80 St Lukes Rd, Mount Albert. M·A·C Botany, Fountain Lane North, Botany Town Centre. Smith & Caughey’s Queen St, 253-261 Queen St. Farmers Centre Place, Shop 81, 501 Victoria Street, Hamilton. Arthur Barnett, 285 George St, Dunedin. These look great, I love the colour scheme for the packaging! I love this im gonna have to try it! "I'm obsessed with your reviews right now you do such a great job!!! ahhh I want all the lipsticks.